These days, temperatures are soaring across much of the USA. While summer is indeed the hottest time of the year, there’s a noticeable difference between 80 degrees and 90 or 100. Until we get more serious about reducing greenhouse gas emissions, I suppose we can expect more of the same (and worse) but in the meantime, you can escape the heat by heading south to around 9 degrees north of the equator. Yep, come to Costa Rica to cool off! We have a lot of mountainous land and it’s way cooler up in them hills than down by the coast or back in the heat-stricken states of Indiana, Virginia, and nearly every other state and province south of Alaska. But isn’t that hypocritical or, at the very least, a climate catch-22 to encourage travel that uses fossil fuels to escape the heat? Maybe not if you do things to offset your carbon footprint (to which a round trip flight contributes much less than mechanized agriculture and industry in any case). Plant as many trees as you can, support organic, locally produced food, don’t buy products associated with deforestation, and feel good about coming down to Costa Rica. 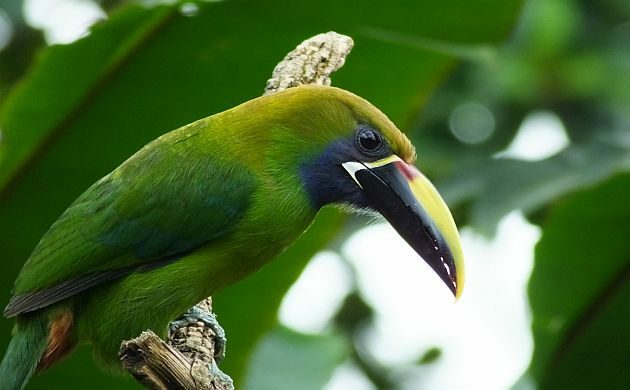 If you want, you can even help reforest Costa Rica by planting trees at Dave and Dave’s, a father and son eco-venture in the Caribbean lowlands that also acts as one of the best spots for bird photography in the country. 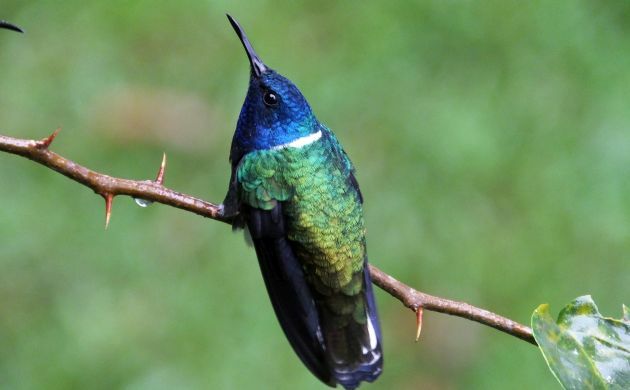 as are equally stunningWhite-necked Jacobins. It is warm and humid at Dave and Dave’s but it probably still won’t be as hot as July in Philadelphia. However, if you would rather bird in places where you could actually wear a long sleeve shirt, you need to increase your elevation and bird any number of highland sites. Lately, I have been checking out a few such places near Poas and Varablanca that are just 45 minutes from the airport. 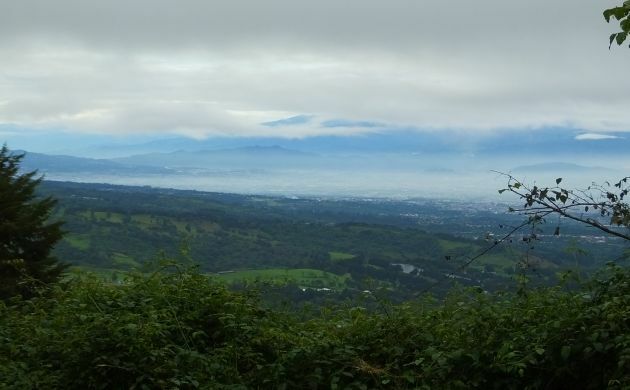 The 1,700 to 2,200 meter elevation cools things down, provides wonderful views of the Central Valley, and offers chances at a number of endemics and other nice birdies. 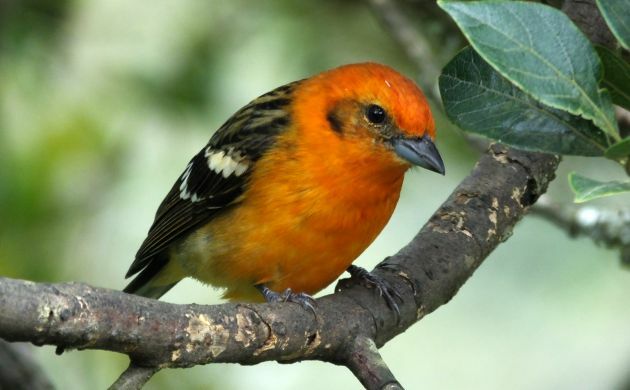 Although Poas Volcano National Park is closed because the volcano is currently erupting, you can still find lots of nice, safe birding on the road up towards the park along with a caveat of very light traffic. The other day, I was up there to do my annual breeding bird survey and it was a fine morning of cool, highland jacket weather birding. Although higher numbers of singing Orange-billed Nightingale Thrushes and Red-billed Pigeons were reminders of bird species with distributions that are moving uphill in response to warmer, drier weather, it was nice to see that good numbers of Long-tailed Silky-Flycatchers were present, and I had a couple of uncommon Yellow-bellied Siskins. A few of the other species encountered that morning were Barred Becard, Red-faced Spinetail, Spot-crowned Woodcreeper, Golden-browed Chlorophonia, Prong-billed Barbet, and Slate-throated Redstart. 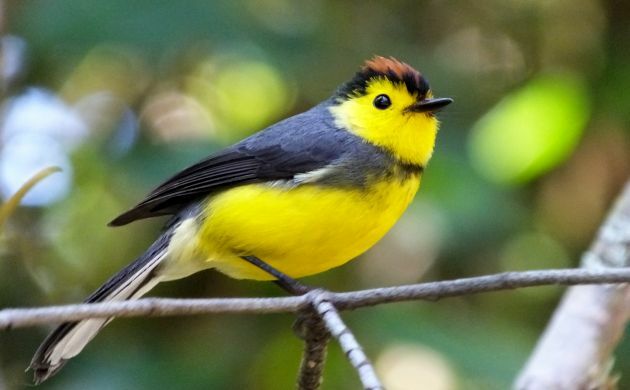 I also had a couple of Collared Redstarts, like the silky-flycatcher, another highland endemic. 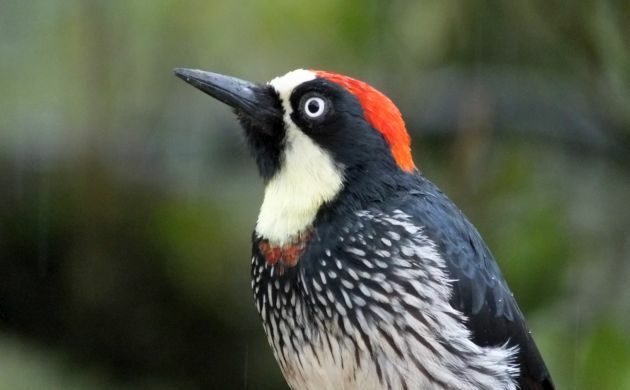 and smart looking Acorn Woodpeckers. Plenty of other species are also possible in that area but if you want to go further afield for even cooler weather, drive a couple hours south and east to Cerro de la Muerte. This part of the Talamanca mountain range has several accessible areas above 2,000 meters and a few areas that reach 3,000 meters as well as the tree line. Bird way up there to watch endemic Volcano Juncos and Timberline Wrens while wearing a jacket. Bird in the high elevation oak forests a bit lower down to look for mega Resplendent Quetzals, rare Silvery-throated Jays, Ruddy Treerunners, Fiery-throated Hummingbirds, and a few dozen other cool mountain birds. 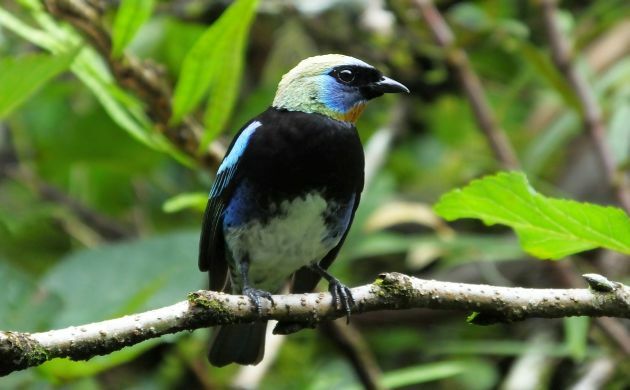 You might enjoy looking for those in the Savegre Reserve, a brand new UNESCO biosphere reserve, and a favorite area for many birders visiting Costa Rica. You won’t find any glaciers in Costa Rica but you can certainly escape the heat. Add several sweet lifers to the mix and that’s a pretty nice way to spend part of any summer vacation. 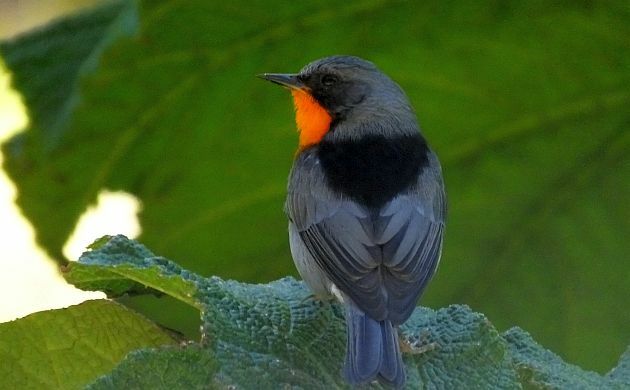 The beautiful Flame-throated Warbler will be waiting for you.